Today we’ll be chatting about how to functionally organize an important part of any office – your file cabinet! If your desk doesn’t have any (or enough) drawer space, I’d recommend looking for a three drawer file cabinet. 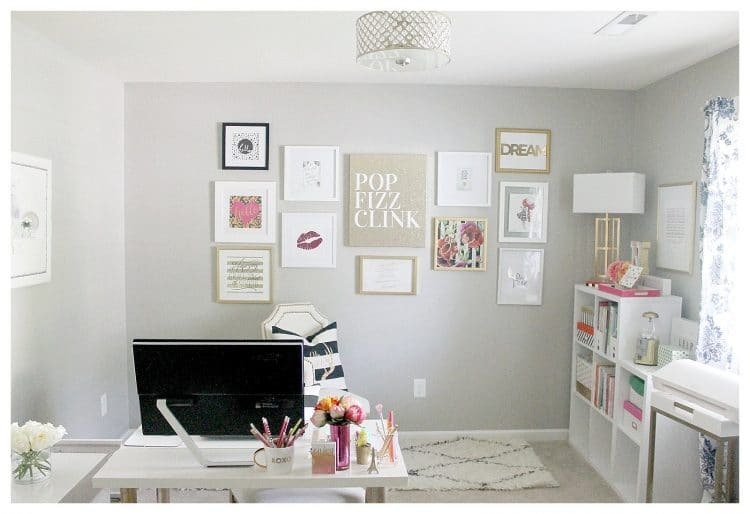 You’ll still get a good amount of hanging file space, along with two drawers of storage for office supplies. It keeps the supplies readily accessible, but still hidden so they don’t create clutter. I found a few options similar to my cabinet for you here, here, and here in a ton of fun colors. Now let’s take a peek inside! 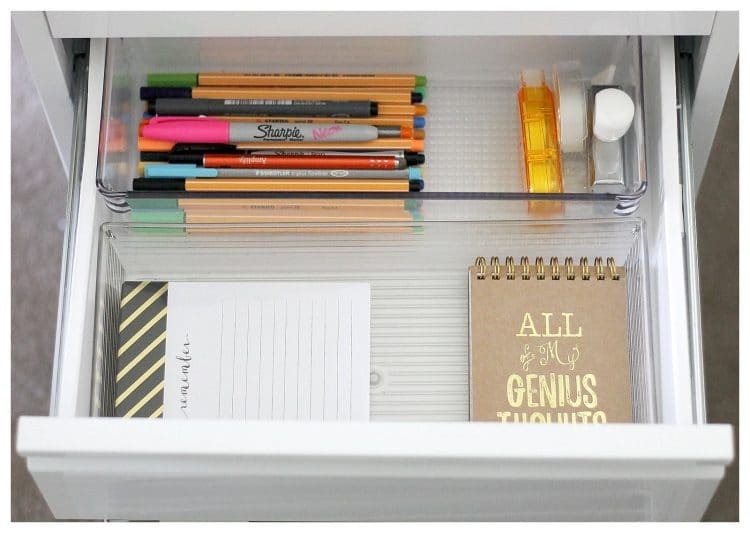 I use acrylic drawer dividers to house things such as sticky notes, paper clips, pencils. Anything that I need to have direct access to from my desk. Dividing up the drawers into smaller sections has been vital to keeping the file cabinet organized. My file cabinet is directly beside my desk, so I’m always reaching for something to write on and something to write with! I love having my most used office supplies within arms reach. The bottom drawer is all about getting important papers organized. I’d recommend keeping your filing system simple so it doesn’t become overwhelming. Each house is a bit different, but breaking things into three categories has been working very well for us over the past few years. Blue – Family Related, Health Insurance, Memberships. I have a folder for each child, my husband, and myself. I place important school papers, report cards, doctor and dentist reports here. My oldest in is his 2nd year of college, so anything that deals with his university, I place in there as well. I also have Sams Club, Costco and gym membership information. Purple – Tax information (Last 7 years) IRA & Pension, Utilities, Bank Account Information, Paystubs for the last 12 months. Every file that I need not only has a home, but it’s organized and I am able to access it quickly. The real key is making sure I file things before they form an overwhelming pile. It takes less than a minute to file any incoming mail each day, and getting it done is SO worth it! 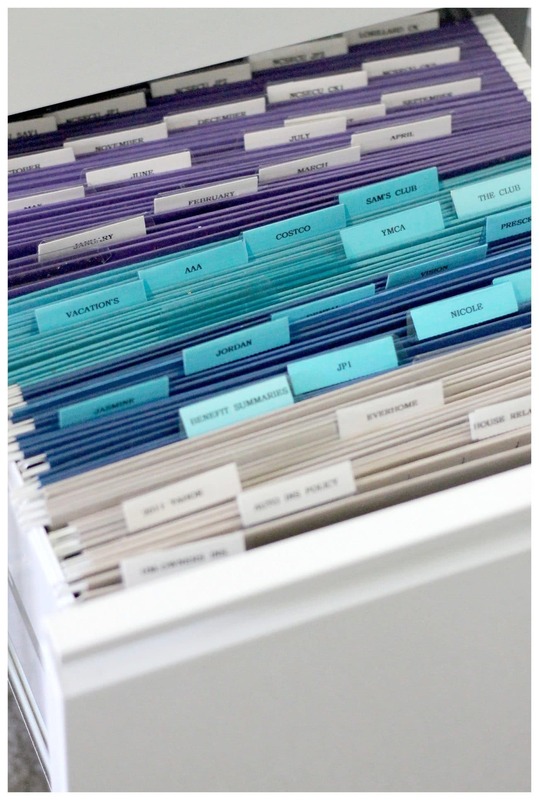 Do you have a file cabinet system that you use? If so, how do you make your system work for you and your family? I like that you keep things simple. And love the color coding. My question is, do you keep the bill statement on bills you just paid? Is it necessary to save those statements for a year? My paperwork and files are overwhelming me. I’m confused on what’s necessary to keep regarding monthly bills. Thank you. Thanks, Ann! 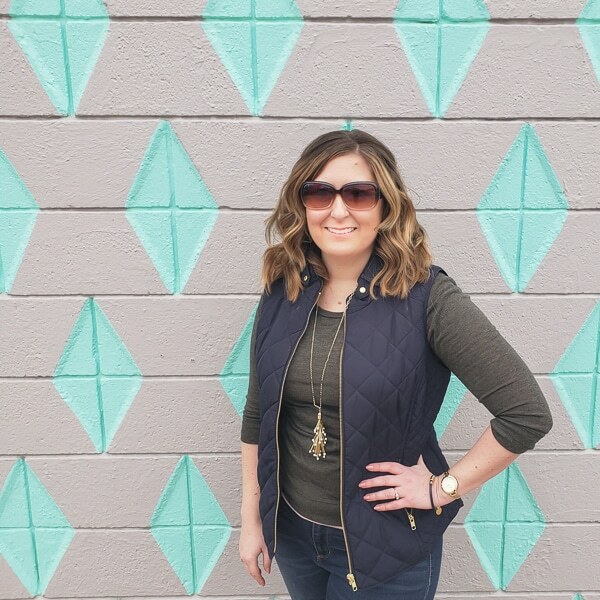 A guest blogger wrote this post, so I’m answering from my own experience of just going through my own files over the last week. 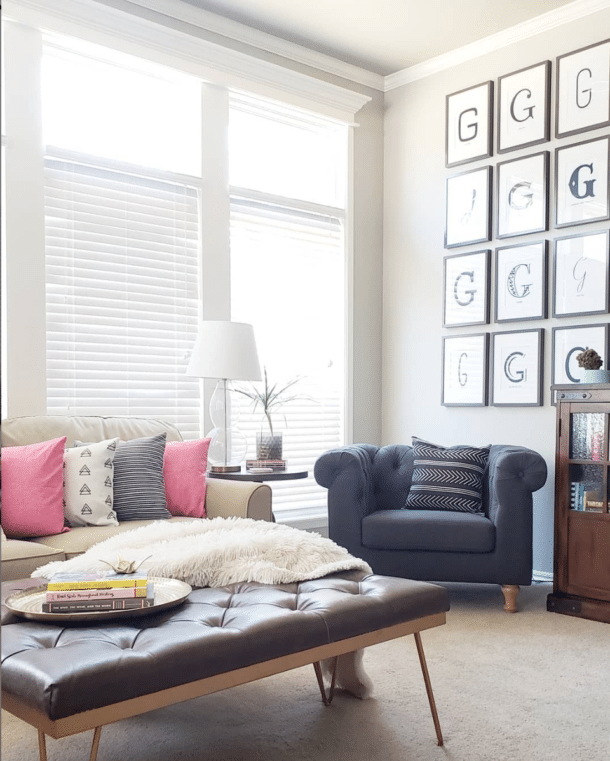 If you are going to be selling your home, enrolling a child in a new school, or use your home as a business and claiming that on your taxes, you may need your utility statements for reference. Other than that, I don’t see any reason to keep them and we shred ours as soon as they are paid. If we had car or other loan, we might keep just the last statement on file until the next one arrived to make sure the principle is going down as it should be. That way if anything funny happened, we’ve have proof of the last month balance. For everything else, in this day and age, we can pull all of them up online or call and request a copy if we REALLY needed something. Hope that helps! 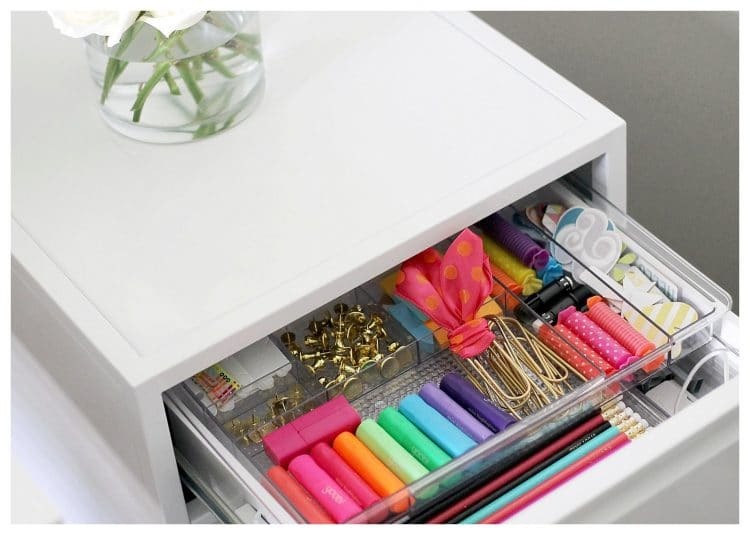 Can you share what organizer was used in the top drawer? It looks like there are two stacked on top of each other. 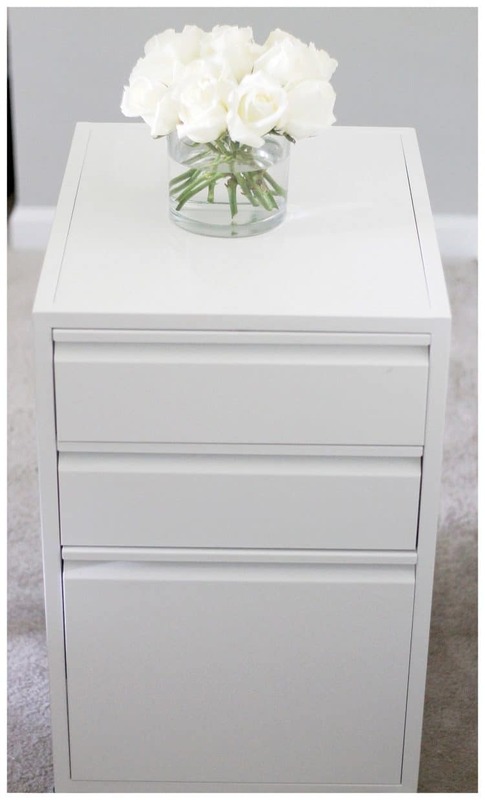 Hi Danielle, It’s this one:https://amzn.to/2SngN38 which hangs on the edges of the drawer so you can use another organizer under it if the drawer is tall enough. Thanks! !